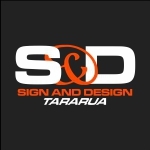 Sign and Design has been in the Tararua district since 2007, designing and producing commercial, personal and industrial signs as well as custom made promotional products, vehicle decals and Worksafe compliant signage. Paul completed a Diploma of Interior and Decorative Art in 1993, along with three years towards an architectural degree and now has more than 20 years experience in various design industries. With experience in architecture, vehicle refinishing and the management of a small business, Paul understands your company and its promotional needs. Having grown up in a small farming town, Paul understands the importance of reliable workmanship and eye catching design. He is well known in the local community and if he can't do it, he will know who can!